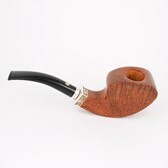 Mastro de Paja was founded in 1972 in Pesaro and after a few years it became the central nucleus of the so called Pesaro school, which includes many famous Italian pipe makers active in this part of Italy. Mastro de Paja Pipes are hand made from the most precious Mediterranean briar and are universally considered to be excellent Italian pipes. Of all the different models created by Mastro de Paja over the years "La Mastro", Mastro de Paja pipe of the year, is undoubtedly the most collected and has a special place in the hearth of many collectors.